In response to a vote from Isle of Wight Labour members to the national leadership for a ballot of its members over Brexit, Independent Labour councillor, Geoff Brodie, asks whether it's time for a ‘Labour Pro-Leave’ candidate on the Island. Cllr Geoff Brodie believes resurfacing of a road - universally recognised by local people as being a total disgrace - being dropped from the list by Island Roads, "is the usual kick in the teeth”. A re-structure at County Hall that will see the creation of new Director level posts and significant salary boosts to a number of other existing senior officers is being challenged by the Independent Labour and Independent Green Councillors. Independent Labour Party councillor, Geoff Brodie, is proposing to re-direct £2.2m of Conservative 'savings' (planned for Reserves) to reduce the Council Tax increase to 4.49%. The Labour Party stalwart says he finds himself "very isolated from the local party leadership" and has left Labour after 35 years of membership. Cllr Brodie says the council needs get their act together and ensure safe pedestrian access to ASDA is provided before someone is killed. Labour councillor, Geoff Brodie, is calling on other members to support the 'Votes at 16' campaign. The Newport and District branch of Isle of Wight Labour Party has been reformed, with membership of over 200 in the town’s seven wards and nearly 50 in nearby villages. 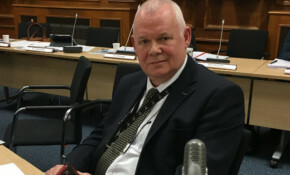 Labour councillor, Geoff Brodie, says he believes Scrutiny members are being "misled" over the controversial decision to fully suspend the Cowes Floating Bridge, adding that "officers are covering for a political decision". Labour councillor for Newport East expresses his disappointment at the "couldn’t care less" attitude of contractors working on the St George's Way roadworks. A return to the Cabinet system, removal of named votes and the questions to Cabinet members at full council being scrapped are just some of the changes planned by the Conservative administration say the Labour councillor.